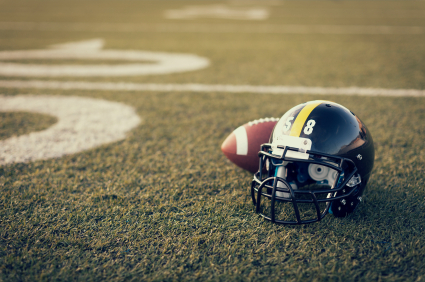 Welcome to Part 2 of our series on injuries and medical conditions that could affect certain players’ selection in this year’s NFL Draft. In Part 1, Prateek Prasanna and I shared our perspectives on University of Alabama cornerback Dee Milliner, University of Utah defensive tackle Star Lotulelei, and University of Georgia outside linebacker Jarvis Jones. Milliner was selected 9th by the New York Jets. The Carolina Panthers chose Lotulelei at 14. Jarvis Jones went 17th to the Pittsburgh Steelers. Also among the players with medical concerns taken in the first round was Houston cornerback D.J. Hayden, who we discuss below. • A routine football tackle in practice almost costs D.J. Hayden his life last November. • Hayden exhibited symptoms of shock and was quickly rushed by medical staff to the hospital. Doctors diagnosed the cornerback with a tear in his inferior vena cava. • Surgeons performed a thoracotomy to open his chest cavity and repair the vein. • On March 18 at Houston’s Pro Day, Hayden ran a 4.40 forty-yard dash and put up other impressive metrics. • Mike Mayock of NFL.com named Hayden as his No. 1 CB prospect in this year’s draft class. • D.J. Hayden was ultimately chosen as the 12th overall pick by the Oakland Raiders. The inferior vena cava is the large vein that returns blood from the lower body back to the heart. Theoretically these injuries are fatal, and they can lead to death by exsanguination within minutes. The athletic trainers and medical staff that recognized the seriousness of his injury should be congratulated. Their quick action possibly saved his life. I wrote an entire column for The Post and Courier on Hayden’s injury. I had difficulty finding a vascular or trauma surgeon to interview about these injuries. They all told me that they don’t see or treat them because patients who suffer a traumatic rupture of the IVC die before arriving in the emergency department or trauma unit. After the surgery, University of Houston team physician Dr. Walter Lowe told reporters that Hayden would be able to return to contact activities in 3-4 months and would need one year to return to normal. Roughly five months after his inferior vena cava rupture, Hayden was selected in the first round of the NFL Draft. • Allen suffered the injury on October 27 against Utah. • He hurt his knee on a failed onside kick attempt by Cal with 1:18 left in the game. • Diagnosed with a Grade 2 posterior cruciate ligament tear in his left knee, he ended up missing three games. • The 6-3, 212 pound Allen was projected to be a possession-type receiver by NFL draft analysts after amassing 205 passes in three seasons for the Golden Bears. • Many projected Allen to be a first-round pick based on his size, catching ability, route running and punt returning. • He did not participate in the NFL Combine like he originally hoped. • He finally works out for scouts in early April. Mike Mayock of NFL Network times him in the 4.7 range – slow by wideout standards. • Allen admits that he is “85 percent” recovered from the injury. The posterior cruciate ligament (PCL) is one of the stabilizing ligaments in the center of the knee, running just behind the anterior cruciate ligament (ACL). PCL injuries occur much less often in sports than do ACL tears. They are often seen in motor vehicle accidents where a passenger’s knee forcefully hits the dashboard, driving the tibia backwards in relation to the femur. In sports, they can be injured when other players directly collide with the front of an athlete’s leg or when an athlete lands directly on a flexed knee. This image of the knee seen on MRI shows a tear of the posterior cruciate ligament (yellow arrow). The severity of PCL injuries can be graded based on the amount that the tibia can be pushed behind the femur on physical examination by the surgeon. Grade 1 injuries are often described as sprains or partial tears. Grade 2 tears involve more severe ligament disruption but less than the complete ruptures involved with Grade 3 injuries. 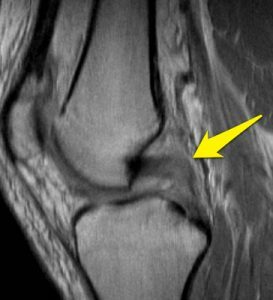 Multi-ligament knee injuries in which the PCL is torn with other ligaments, such as the ACL, LCL, or posterolateral corner structures, often need to be reconstructed surgically along with the other ligaments. Isolated PCL injuries, however, can often be managed without surgery, as Allen’s seems to have been treated. Aggressive rehabilitation to regain quadriceps strength can often get athletes back to play. Occasionally players with isolated PCL injuries continue to experience pain or limitations of function, and formal PCL reconstruction can be performed. Read Part 1 of NFL Draft 2013: Risk or Reward. Stay tuned for Part 3 of the series tomorrow. If you were an NFL team general manager or coach, would any of these conditions or injuries worry you about drafting the players? How would you balance the risk and reward to make a decision? Share your thoughts below! NFL Draft 2013: Risk or reward?